Most startups are actively on the lookout for investments to further spur their growth. Many startup-investor relationships exist based on these investments. 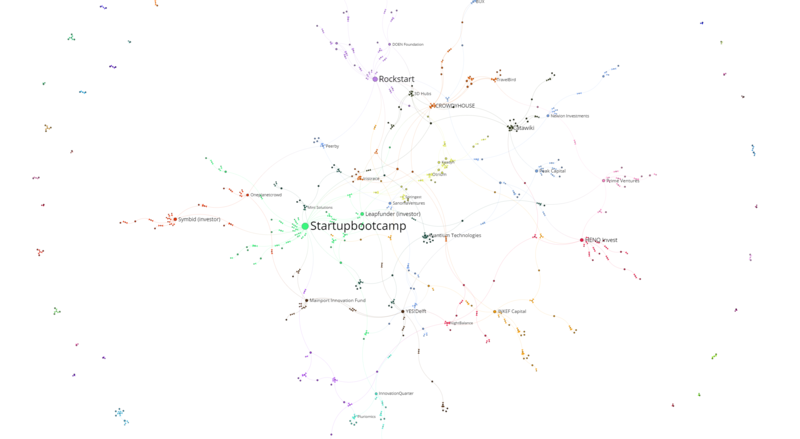 Just how connected is the startup ecosystem when looking at these relationships? Let’s apply the principles of network analytics to Dutch startup data and find out. Startup success is often reported on by looking at the funding received from investors in funding rounds. According to StartupJuncture, Dutch startups raised €265 million in funding in 2016. All these investments led to a wealth of data, including information on the portfolio structure of investors in terms of which startups they invested in, which amounts were raised, and which sectors are most prevalent in these portfolios. When an investor invests in a startup, they actively engage in setting up a relationship with that startup – essentially, we can thus infer many investor-startup relationships just by looking at the completed funding rounds. We’ll be using these relationships here to model networks of startup-investor activity in the Dutch startup ecosystem and visually gain insights based on this. The data used in this blog post originates from Dealroom, a venture capital and private equity database which holds detailed information on over 500,000 companies, their investors and related funding rounds. We collected data on all Dutch startups which a) have received at last €10k in funding, b) have at least one investor listed in the dataset, c) are listed as ‘operational’ and d) are in the ‘seed’, ‘early growth’ or ‘late growth’ stages. 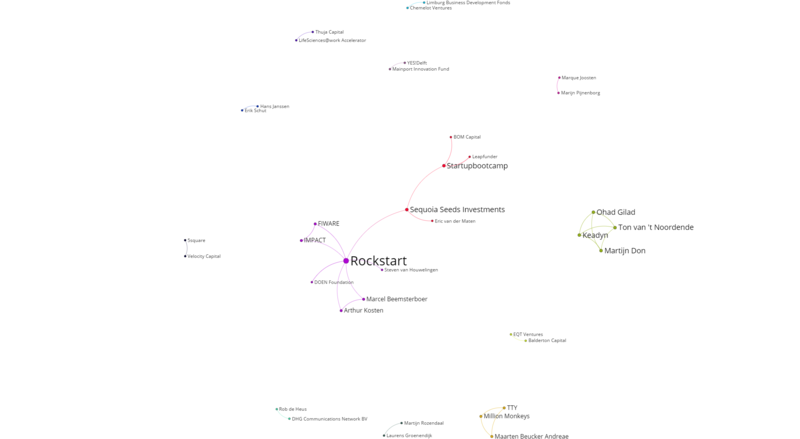 The final dataset then includes 275 startups and 334 investors in these startups. We can now model the data as a network in which startups are connected to their investors. This is also called a two-mode or bipartite network, since we’re looking at the connections between two distinct node types. In the interactive visualisation below, squares are startups and circles are investors. The larger a node, the more investors it has (for startups) or the more startups it has invested in (for investors). Colors are assigned to nodes based on a community detection algorithm. You can hover any node to focus on its connections. Clicking a node shows more information in the panel on the right. You can pan around the network by holding the left mouse button, and zoom in using your scroll wheel. Please note: the visualisation is optimised for desktop viewing. You can view a full-screen version here. The large interconnected group of nodes in the middle of the network consists of all startups and investors which can reach each other in some way based on their investment relationships. This so-called giant component holds 69% of all the nodes in the network – 74% (204) of all the startups and 65% (216) of all the investors. Practically speaking, this means that about 3 out of 4 startups in the network can reach each other through some path based on investment activity. In terms of number of investments, accelerators Startupbootcamp (33 investments), Rockstart (21) and YES!Delft (10) stand out. When looking at investment funds, henQ (12 investments), Prime Ventures, INKEF Capital and Mainport Innovation Fund (all 9 investments) are some of the most active investors. Each of these investors occupies a distinct position in the network, resulting from few shared investments with other key investors. The closer investors are in the network, the more shared investments they have – for example, YES!Delft and INKEF Capital both participated in NightBalance, a startup which develops a device to treat sleep apnea. The startups and investors outside of the giant component are placed in the periphery of the network, although of course this does not mean their numbers are insignificant. For example, all the way at the top of the network we see online supermarket Picnic surrounded by the consortium of 4 investors which recently invested €100 million. These investors did not participate in any of the other Dutch startups in the network, resulting in Picnic being disconnected from the main group. Using the same data, it is also possible to project direct relationships between startups based on shared investors, or between investors based on shared startups in their portfolios. These projections are called one-mode or monopartite networks, since now we’re looking at connections between nodes of the same type based on shared properties. The connections in these networks are weighted: for example, when two investors co-invested in 3 startups, the weight of the connection between them will be 3. 37 investors have co-invested with each other more than once; for example, Leapfunder and Startupbootcamp both participated in startups Buzzoek, ProctorExam, ULU, clevergig and DashTag. Sequoia’s seed arm connects accelerators Rockstart and Startupbootcamp. You can of course look up the investors in the interactive visual above as well to visually see which shared investments they have. Network representations of data provide an opportunity to focus on the actual connections residing between data points. In the visualisations above, this allows one to explore linkages between startups and investors interactively and gather insights on the direct and indirect connections in the network. This can be especially helpful when quick, visual insights into market activity are necessary, or when aiming to identify potential investors based on direct and indirect co-investments in past funding rounds. Feel free to explore the interactive visual and leave any further insights in the comments below!